Our site is secured by a GeoTrust SSL certificate, providing up to 256 bit encryption, and thereby offering the highest level of encryption and security possible. This means you can rest assured that communications between your browser and this site's web servers are private and secure. PETE VON SHOLLY has been drawing since childhood, when he was mesmerized by Famous Monsters of Filmland and classic monster movies on TV. A career as a Hollywood storyboard artist on over 100 feature films includes Mars Attacks!, James and the Giant Peach, The Shawshank Redemption, The Blob, Nightmare on Elm Street III & IV, The Green Mile, and The Mist. Pete has illustrated several H.P. Lovecraft classics, a lavish edition of Stephen King’s Skeleton Crew, and has written and illustrated 4 graphic novels published by Dark Horse, IDW, Kitchen Sink and others. His ventures into political satire were praised by The Washington Post and cited by The Village Voice as best comics of the year. Pete Von Sholly’s History of Monsters is a glorious look at the phenomenon of monsters as they figure in pop culture as well as from the anthropological, psychological and societal angles. This unprecedented illustrated pageant shows the actual history of monsters from man’s earliest fears of the darkness beyond the fire to today’s nightmares to see how these terrors found expression in myth, legend, and entertainment. But whatever the time or medium it’s always in the unknown where the monsters lurk and fester and wait. 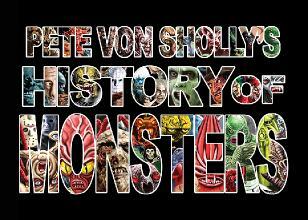 Step into Pete Von Sholly’s History of Monsters and experience the story as never before.